We also went to a hockey game last weekend which was also on my bucket list of things we have to do in Kharkiv! The team here is the Kharkiv Dynamo (which means dynamic) and the season was gearing down so I knew we had to make the most of it and make it out to a game soon. The arena was kind of in the middle of no where and we had to take the metro to a marshrutka (little bus)....riding marshrutkas is always interesting here because they jam them full (max capacity was 43 people) and I never know where I am going. It's not because I have a bad sense of direction it's because they go so fast and they are crammed full of people so it is difficult to figure out where you are especially when we are in the Soviet apartment blocks and everything looks the same. Luckily, we relied on the kindness of strangers who told us where to get off and then directed us to the arena. We opted for a tram on the way back and again a really nice guy helped us get back to the metro and even made sure we knew which stop we had to get off at! We got to the game a little late and the arena was packed so we ended up sitting in the front row. We realized after sitting down why the seats were free...because of the huge bar blocking your view. Still the entrance to the game was free so we didn't complain! This is the symbol for the Kharkiv Dynamo team. The pretty awesome goalie modeling their home team colors. It was standing room only for most of the game...either that or these people just wanted to be close to the bar! The flag of Ukraine, the Flag of Kharkiv oblast (region) and then the Kharkiv City flag. The final score. The game was actually really close and it was 1-1 until the last ten minutes or so. This past weekend we went to the Dolphinarium in Kharkiv that is located in Shevchenko park across the street from our house. The dophinarium is an arena for dolphins and I heard rumors that the mayor of our city sent somewhere and saw a Dolphin show and decided that Kharkiv just had to have! I have been wanted to go see the show for a while but we decided to wait to do some of the indoor things in the city until it got cold. It was actually the perfect thing to do on a cold wintry night in Ukraine because the arena was warm and well light so it felt like we went to a tropical destination for the hour long show. The tickets were around $10 which is more expensive than most things in Kharkiv but it was a really great show and totally worth it! Matt and outside the arena with a very snow covered/creepy dolphin. This reminded me of the Simpson's episode where the dolphins take over! There are no real trademarks here so the name of the arena is Nemo. The seals were the opening act. There were five dolphins, a baby dolphin, and then a white beluga whale. This is a more clear shot of the dolphins and the whale. This was the best trick of the night two dolphins jumping through the hoops! One of the trainers riding the dolphins. They beached themselves after all the tricks to get some treats! We went with our friend Kali who is a Peace Corps Volunteer in a smaller town outside of Kharkiv. She is from MN and interested in the counter-trafficking movement here and so we always have a lot to talk about! 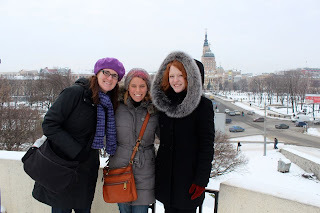 The real downside of all the hassles with our flight was that I had two friends who were coming to visit us in Kharkiv when we got back so really they were the ones who were inconvenienced by the whole thing! We met in Kyiv and then took the train together to Kharkiv. It was fun to show them Kharkiv and tell them everything I knew about the city where I live! Plus we were all in the same class on the Critical Languages Scholarship program to Kazan, Russia this summer so they speak Russian and it was nice to hear all about their adventures since the program. One of them is studying in St Petersburg and the other is teaching in Georgia (the country not the state). I think they will be the only visitors we will have this year and we found out that one of them is actually kind of related to my husband because apparently their cousins are married to each other! So that's about as close to a family visit in Kharkiv as we will get! This is the three of us in front of Blagoveshchensky (Annunciation) Cathedral. One good thing about having people visit is that you always learn something new about your city. This is a statue of Taras Shevchenko the Ukrainian national poet near Pushkinskya metro, the metro stop named after Pushkin the Russian national poet. We also found this cool book market which was closed by the time we got there but still it's good to know it's there for all my future book needs! We were able to get a flight to Ukraine a day later than we originally planned and so we went to the Riga airport on Monday for our flight. After sitting at the gate for a while I went to the bathroom and saw this sign. I really couldn't believe my eyes....it is a poster about the warning signs of human trafficking from Marta Centre the non-governmental organization where I worked for a year. They develop advocacy and awareness campaigns on human trafficking and other women's issues and they also have a shelter rehabilitating victims. This sign tells people to call the trafficking hotline at Marta Centre if they have experienced any of the warning signs of human trafficking during their travels. It was sponsored by the Body Shop and was part of a grant I wrote when I worked there! It was a pretty cool moment for me to see this and know that I was a small part of the reason that sign was there. It was a wonderful last surprise for me in Latvia during human trafficking awareness month! On our back to Ukraine we had a stop over in Latvia. SAS was having a big sale and so our tickets to and from Riga were much cheaper than flying to Ukraine and then out of Latvia. Then I bought a separate ticket to Ukraine on Aerosvit a Ukrainian airline. When I got to Latvia I had an email from Aerosvit saying our flight to Ukraine was cancelled. After doing more research I found out that the airline declared bankruptcy the week before we were supposed to fly and started cancelling flights. So even though our flight was code shared with Air Baltic, Aerosvit didn't pay them for the ticket so we had to buy entirely new tickets to Ukraine! It's kind of a classic story about Ukraine and the plus side was we were able to stay in Latvia an extra day! We stayed with my wonderful Latvian host parents Saiva and Andris. Hot Balzams one of my favorite drinks! Christmas markets in Old Town. Even though Latvia is a Lutheran country and they celebrate Christmas on December 25, about 30 percent of the people living in Latvia are Slavic (Russian, Ukrainian, Belarussian) so because of Orthodox Christmas and New Year they keep the markets running until after old New Year (January 14th). Another Christmas market in Esplanade. You can see a very skinny Santa in the background. Of course it's Latvia and there is always some sort of folk singing and dancing. The Orthodox Cathedral is in the background. More Christmas markets in Doma Laukums....I love this country! Me at my favorite place in Latvia the Brīvības piemineklis or Freedom Monument. I couldn't believe my favorite store had come to my favorite country...I had to see it to believe it! I also got to check on the progress of the new Latvian National Library named Gaismas Pils the Castle of Light taken from a Latvian folklore. I was hoping it would be open by the time I got to Latvia to do my dissertation research...they said sometime in 2013 so we will see! I was fortunate to be able to come to the US for the holidays during my research. We had originally thought about staying in Ukraine but then my sister set the date of her wedding for December 30, 2012 and we couldn't miss it! Overall it was nice to be home, relax, and visit with everyone. And I only had to explain to one out of every three people who asked me how Russia was that we were not in fact living in Russia but the entirely separate country of Ukraine. Here are some photos from my adventures. Matt and I with our crowns from our Christmas crackers. Matt's grandma is British so we have a traditional British Christmas dinner including goose and of course Christmas pudding which is not pudding at all but a cake that you douse in brandy and light on fire. My beautiful little sister on her wedding day! Matt and I getting ready! My good friend from grad school who now lives at home in Germany was visiting her husband's family in Fargo for the holidays and she stopped in MN for a visit. This is us in front of "arguably" the most famous landmark in Minneapolis/St Paul. We also got drinks with my sister at the Foshay Tower, the first skyscraper in MN built in 1929 and the tallest building until 1971.